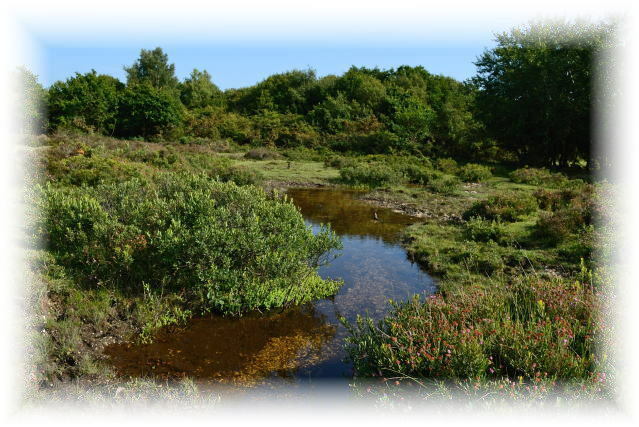 Nationally noted as one of the premier dragonfly sites in Britain, this tranquil and popular gravel-based stream is fed from the boggy springs of Beaulieu Common. The area also contains 4 seasonal ponds and several boggy areas upstream. Crockford is one of the best sites to observe the spectacular Golden-ringed Dragonfly and rare Southern Damselfly, as well as the Beautiful Demoiselle among it's 28 observed species. It's close proximity to the coast means that the Hairy Dragonfly is a occasional visitor. The main area of activity is the clearing. The open stream is usually patrolled by Golden-ringed in season along with other species such as Beautiful Demoiselles and Keeled Skimmers. The banks of the stream has many Bog Myrtle bushes which are the preferred habitat for Southern and Small Red Damselflies. Be sure to explore every inch of the gorse thicket to the south of the stream for perched dragonflies. It's possible to more or less follow the main stream NW to Two Bridges Bottom where there is a large pond worth exploring, but for me the open pools around the ford and the stream leading down from Deep Moor are superior, as is the whole stream from the ford to Upper Crockford Bottom. It's also worth taking some time to explore the lower reaches of the stream for quieter observation. I'm spring this season I paid a visit and was very disappointed to find that they've done some extensive clearing; to the point that the above view is no longer a true representation, but I will leave it here for the time being, to remind us all how it was. The view above is of the key clearing which is now totally unrecognisable. Those trees in the background are gone, and so is all the surrounding scrub. I have raided concerns about the level of work carried out and have been answered that it is to the benefit of the Southern Damselfly. Time will tell I guess, and it will be interesting to see if the same level of odo populations are still so abundant after clearing their safe refuges and feeding grounds. I've certainly found more Southern and Small Red damselflies feeding and resting among the now razed heather stands. The area is host to ground-nesting birds in spring and early summer. Crockford Clump and Crockford Bridge are open from August 1st.